Me Myself and Soham » Soham Whispers But Loudly !!! Well, the grand old party of India Congress has done it again which it does the best since independence – Misgovern and Mismanagement .. It first divided us on religion basis when our highly qualified and quite sober PM Mr. Manmohan Singh calmly and tactfully said that ke minority of India has the first right on everything which belongs here (Yeah, yeah : as if we majority has done some kind of crime in this country which we proudly called as Hindustan !!) ..
And then it touched the lowest bottom when the prices of vegetables, oil, fruits etc went way way way high that an aam aadmi (common man) cant even cope up with .. Cant even survive .. Cant even live .. But it does not affect them .. They are still more concerned about SRK and his film My Name is Khan .. But no one is really concerned .. Not Congress .. Not opposition .. Not media .. Not Burkha Dutt or Not Rajdeep Sardesai ..
Pakistan is killing our army jawans on a daily basis .. It is bombing and firing at borders and violating cease farm since last two weeks .. It invades our home and kills people in hospitals, local trains, hotels, bars, railway stations .. But still we need them to play cricket here .. we need them to sing in our films .. We need them for ‘Aman ki Asha‘ .. I still feel that where have our self-respect, Indian pride, patriotism vanished? .. we have not achieved anything by talks with Pakistan in last 60 years so now why we need Aman ki Asha? .. Seriously we are blind-folded and programmed by few so-called intellectual people and we are making huge huge mistakes .. But we are Indians and we never learn from our mistakes .. So I’m neither shocked nor surprised ..
People of India often take out their disgust and anger on Indian politicians and frankly most of them deserve this anguish .. But in Gujarat, there is a different trend altogether .. 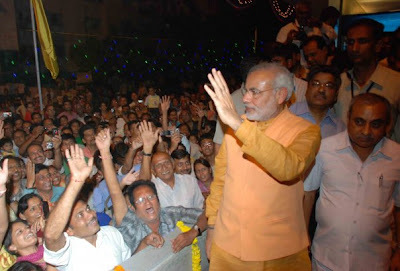 Here people just love, adore,admire and respect their CM – Mr. Narendra Modi .. 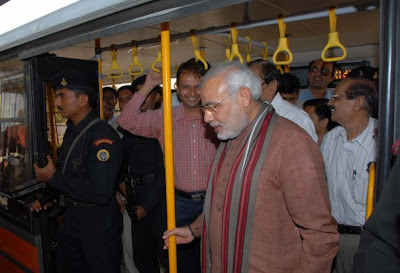 Yesterday Mr. Narendra Modi travelled in Bus Rapid Transit System(BRTS) – Janmarg local transport bus to reach GMDC ground where a get-to-gather with media persons was organized. After buying a ticket, he boarded the bus and started his journey towards the destination ..
One lady who looked quite well-off and educated asked for Modi’s autograph and also requested that he must write the date and time so that her family remembers can believe that she was with Modi in a bus ..
One gentleman asked Modi to talk to his wife on his mobile phone and Modi happily acknowledged his request .. While returning Modi took the same bus .. This time he was not taht lucky as there was no vacant seat .. So he completed and enjoyed his journey by standing all the way through .. Of course people offered their seats to their heart-throb CM but he politely refused it .. Many school and college students asked for his autographs and he happily their wishes .. I have not seen people taking autographs other than of film starts or of cricketers .. Truly remarkable and noteworthy ..
Incidentally, yesterday Modi completed 3000 days as Chief Minister of Gujarat. So the CM(Chief Minister) mingled with CM(Common man) ..
3000 days but still people love and respect him the same as they used to do when he sworn in as CM for the first time ..
3000 days but there is no single anti-incumbency factor against him or against his governance ..
And it’s worthless to mention about Gujarat’s progress under his dynamic and visionary leadership .. Statistics, awards and all the surveys tell the story themselves let alone people’s love and respect for Narendra Modi ..
… faded in oblivion. Everyday commuting and work keeping me busy like hell. But even in that busy schedule, I watched two movies recently. First one was ROCKET SIGH .. It was kind of OK but presented a very good message of honesty and business ethics .. Ranbir really rocked .. next superstar I guess !! Second one was like a unimaginable unprecedented cinematic experience of life time .. Yeah, you have guessed it right .. It was AVATAR 3D .. It just took my mind away with the story, screenplay, photography and animations .. It too gave a good message of bonding between living entities like animals, humans and trees .. Just felt like I was in a different world .. Kaash I can go and stay in Pandora for a while !! So Christmas is around the corner so let me wish you all a merry Christmas and happy new year..
Sachin recently hit the tremendous 175 against Australia but his toiling efforts went in complete vain as our tail-handlers could not even score 19 runs .. As soon as Sachin was back in the pavallion, the rest of the batsmen fell like a pack of cards .. We lost the battle by a very very narrow margin .. I mean it’s nothing new .. It has happened so many times now that we are used to it now .. I was so dishearten and disappointed and so as millions of other Indians and cricket fans .. Recently got a forwarded mail which states the reson why Sachin is hated everywhere and it truly reflects my thoughts and my mind .. He is going to retire sometime in the future .. A slightest thought about his retirement brings tears in my eyes .. When he will retire, I feel that my life will come to a complete standstill .. How will I live without watching him on the field, without seeing him scoring tons and tons of runs, without hearing his baby voice .. Uffff , why Sachin why ?? .. Why were you born In India and why did you play cricket ?? .. We just love you so much that we cant see you going ..
As they say, commit all your crime when Sachin is batting, coz even GOD is watching his batting. That he can feel more pain than the youngest team member and the oldest fan, is a fact that deserves a story by itself. But for me, that is enough to forget my pain and stand in unreserved applause for the man who makes me feel more Indian than any other. So true !! Hats off to the master ! !